As a best-in-class solution Knowledge Connect provides innovative features to integrate, search, enrich and share information. You already know what your looking for? Knowledge Connect allows you to gather extensive insights to your business environment. Integrate a broad range of external sources to the Knowledge Connect platform and combine them with your in-house knowledge to identify and adapt technological trends, monitor your competitor’s actions or gather insights on market developments, regulations or M&A moves. Charts, Graphs, Financials, RSS Feed, Reports, Brochures, Presentations, Profiles, Articles, Press-Portals… and many more. With Knowledge Connect you will be able to build up your own taxonomy, search for specific information and classify the information based on companies, categories, topics or regions. 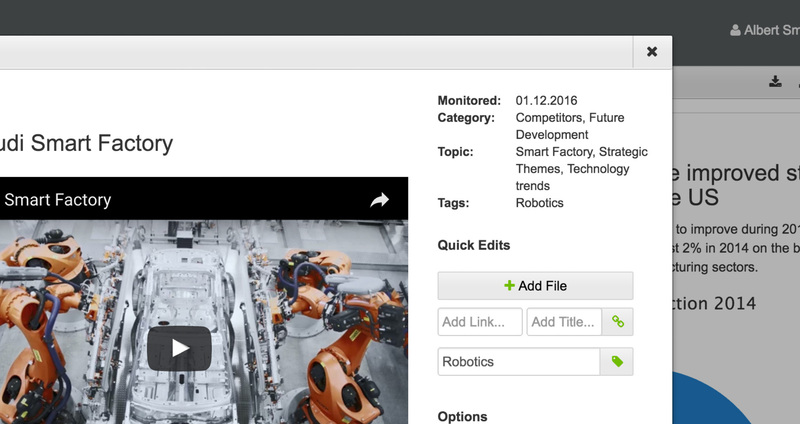 Using tags you can categorize your sources by technologies, themes, competitors or any other topic you desire. Our intuitive navigation and smart search algorithm allows you to quickly identify the information you really need. Save your search results for later access or export the results to PDF or excel sheets. Knowledge Connect provides a structured environment, where you can organize your users in groups such as business units, market segments, regions or any other classification. You define which information should be relevant for them. 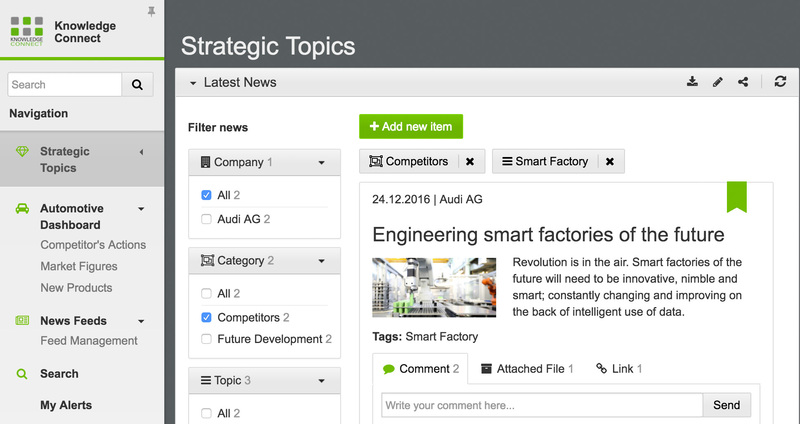 Knowledge owners can comment, add or even rate information to enrich knowledge. Take advantage of collaboration features and make your decisions based on enriched intelligence founded on both structured and unstructured as well as internal and external knowledge. 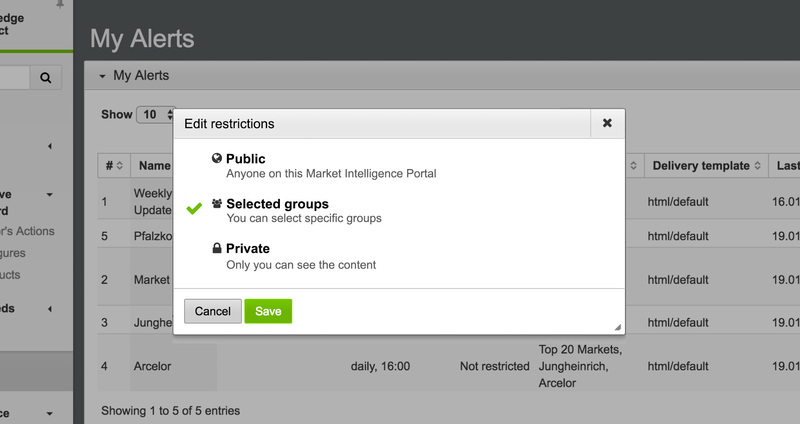 Create and manage your personal knowledge and share it with your team or other knowledge owners. Automated Newsletter, Alerts and Push E-Mails allow you to quickly inform desired users and keep them up-to-date on current developments. Share information across different groups to connect them to relevant knowledge. 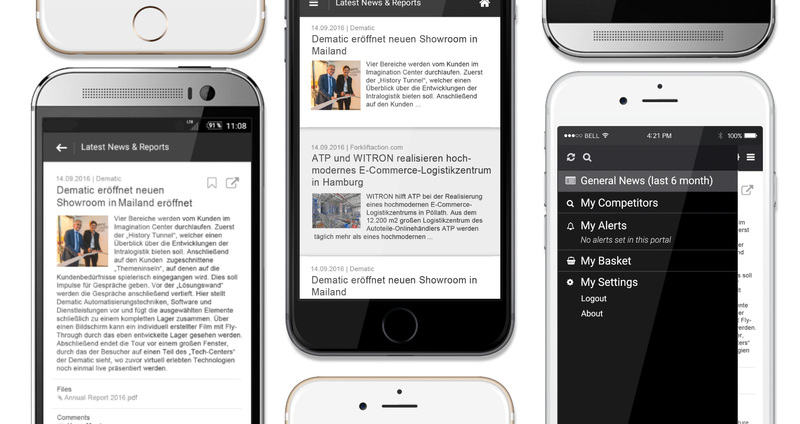 The unique Knowledge Connect Mobile App for Android and iOS allows users to stay informed and access important files and data anytime, anywhere.